Want good wear from your drag shoes? Trying to weld 'carbide inserts' into current drag shoes that have lost their carbide? The fact is, all carbide is not created equal. Here are some insider tips on how to source your carbide and what you should look for when you inspect and spec your commercially-made drag shoes. All managers and purchasing agents involved in power sweeping – and perhaps especially contractors who are buying their own drag shoes – need to have some education about carbide. The plain fact is that when it comes to usage in drag shoes all carbide is not created equal. There are two basic types of carbide available for drag shoes. Virgin carbide is material directly from a mine, in other words carbide that has never been used for another purpose. The largest supplier for carbide, which is considered a 'rare-earth metal,' is China. Due to the recent restrictions in export of rare-earth metals that China has imposed, virgin carbide is becoming both more expensive and, as was the case toward the end of 2010, not even available. Some applications, including sweeper drag shoes, are able to use carbide pieces that have been worn out in other applications. These include prior use as cutting tools, boring tools and a variety of other uses. Typically, these carbide pieces had sharpened areas for their prior usage and, once they have been dulled and the carbide is no longer useful for that application, they are sold into the scrap carbide market. In most instances, the fact the carbide has already been used for another purpose does not impact its longevity for use in drag shoes. However, the type of carbide it is composed of, including its overall grain structure, are important. 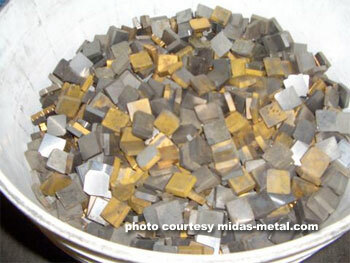 Another factor that makes a difference with previously used carbide is whether or not it was coated in its prior usage. Here's why those factors make a difference. Grain size is a big factor in determining what type of carbide is chosen for use in different applications. Here are the 'rules of thumb:' The smaller the grain size, the harder the carbide; the larger the grain size, the stronger the carbide. What is called 'insert-grade' carbide needs to be very hard for the cutting of metals and therefore the preferred grain size is very small. By contrast, 'mining grade' carbide is made for cutting through rock and dirt and therefore needs to be very strong and resistant to shock. Consequently, top quality mining grade carbide is made with larger grains so that it doesn't break apart in use. That durability also makes larger grain carbide a better choice for the application of sweeper drag shoes. Another advantage of mining grade carbide is it never needs a coating. Coatings are often used on insert grade carbide to improve the cutting characteristics for the cutting of metals. These coatings vary in color, from clear to silver to gold, and weld material will not adhere to the coated surfaces. In order to weld these inserts into drag shoes, any such coatings have to be removed in a process that has widely variable results. Consequently, welding inserts that have previously been coated into drag shoes is never an absolute process. On the other hand welding mining grade carbide into drag shoes is an absolute process with a very low failure rate. Here are the central questions you should ask of any drag shoe supplier. First, find out if they are using virgin carbide or carbide pieces that have been in use in another application. If they are using virgin carbide, inquire about the grain size. When you buy from them, also inspect the carbide in your inserts to evaluate the stated grain size is also the size that's being used. Ideally, you should be able to see the grain in your inserts with your naked eye. If they are using carbide from the scrap market, ask if any the carbide may have had a coating, or if they reject any coated carbide from usage in drag shoes. You do not want to purchase any drag shoes that use previously coated carbide. Period; end of story. As long as it is wide-grained and has never had a coating (i.e., is mining grade carbide), scrap carbide is not inferior to virgin carbide in any way. As full disclosure, Sharpco uses only mining grade carbide. We are the only aftermarket producer of drag shoes, to my knowledge, who certify this is the case. That's a significant reason why we have received many customer comments that our shoes outlast other producer's shoes. If you'd like to contact James Sharplin, send an email to jamesf@sharpco.com. Sharpco Drag Shoes may be reached by calling 800-372-5007.